This second edition of “Numbers Don’t Add Up” dissects the 2016 endangered Lake Washington Chinook run. Similar to what we reported on the 2016 Coho run in this same watershed, again we find thousands of fish disappearing between the the Ballard Locks and spawning grounds/hatchery. Something, or more likely a combination of things, is clearly amiss with this run. Let’s dig in. This analysis focuses on Chinook salmon that returned to the Lake Washington watershed in 2016. The returning fish are actually a mixture of two distinct stocks–some ‘marked’ Chinook are raised at the Issaquah hatchery, and some ‘unmarked’ wild Chinook salmon born naturally in the feeder rivers/creeks of Lake Washington. This latter group of naturally spawning fish is a listed Endangered Species and as such is an extremely important part of Puget Sound conservation and restoration efforts. These naturally spawning fish also play a central “driver stock” role and significantly constrain Seattle area fisheries targeting other healthy stocks. In fact it was concerns over this specific Lake Washington run that caused the cancellation of the entire King Salmon season off Seattle in 2015. So it should go without saying that this run is vital to monitor, manage, and document in a credible, accurate and transparent way. The most transparent data points in the entire system are the Ballard Locks counts, updated regularly on the WDFW website. We can use them to determine some important baseline facts for the 2016 returning fish. First, the locks counts give us a window into the respective strength of the two stocks: hatchery bred vs. native fish. The counts last summer showed that 23% of the returning fish were unmarked ESA wild Chinook, and the balance (77%) were marked fish bound for the hatchery at Issaquah Creek. This 23% number will come up again later in this analysis, so keep it in mind. Specifically, we’ve reviewed the escapement reports from the Cedar River (1025 counted), Sammamish Populations (1247 counted), and the Issaquah Hatchery (2596 counted). Summing this up, we can only account for 4,868 fish reaching the spawning grounds. Simple subtraction says somehow 4300 King salmon, or 47% of the run counted at the locks, simply disappeared. These aren’t small fish who are easily misplaced. We’re talking about over twenty tons of salmon that is simply unaccounted for once it passes the Locks. Even worse, 1,287 of the 2,203 endangered wild fish (55% of the total counted at the locks) disappeared in the final 20-odd freshwater miles they had to navigate. That’s an alarming percentage, and should have the attention of every fisheries manager looking at Puget Sound. These fish survived for 3 years and traveled thousands of ocean miles — yet just before spawning they vanished. The consequences of these fish failing to reach their spawning grounds are profound. These ESA Chinook are a key driver stock for Puget Sound fisheries all the way out to the Straits of Juan de Fuca. The rise and fall of this single run of wild fish has tremendous economic impacts on the state. To those not close to the season setting process, the magnitude of these losses may not be obvious. So let’s make this a bit clearer with an example. We’ve observed that between the Locks and spawning grounds, 55% of the ESA listed Chinook disappeared. Let’s compare that to the WDFW model for all 2016 sportfishing impacts on this same run. For the entire state (Straits + Puget Sound + Lake Washington itself) and the entire salmon season (Summer + Fall + Winter) all selective sportfishing combined impacted just 5.2% of this run. You’re reading that correctly. The mysterious disappearance of these fish is ten times more impactful than all sportfishing in all marine areas combined. Possibility 1: Did Somebody Catch Them? There is no sport-fishery in the Ship Canal, Lake or rivers for Chinook, and it’s difficult to imagine that a rogue sport hook/line fishery went unnoticed yet still caught thousands of these fish. We’ve additionally scoured 2016 fish checker reports and can’t find evidence of a single Chinook being landed in error during the sport Coho season. In short, we don’t believe sportfishing is a significant factor here. On the other hand Tribal gillnet fisheries could be a factor–because gillnet fisheries targeting Coho began on the 11th of September–both above and below the Locks. By this date the Chinook run is well past its peak, but certainly Kings are still moving past the Locks and are present in the Ship Canal itself. So let’s look a bit deeper into these fisheries. We don’t know what time of day the locks counts (a statistical sample, not a full day count) are conducted, so either the 11th or 12th was the first “post-gillnet” count day. What we can say is there appears to be a significant dropoff of Chinook through the Locks within 1-2 days of the nets going in. At least by inspection, it appears likely the Suquamish (saltwater) side netting had some impact on Lake Washington Chinook. This isn’t illegal, nor is it entirely conclusive, but it’s an important observation, and certainly part of the impacts on these endangered fish. What Chinook Gillnet Impact Was Expected? On the fresh water side of the Locks, the Muckleshoot Tribe reported 306 Coho and 47 Chinook caught in September — or 6.5 Coho per Chinook. This ratio of Chinook/Coho is significantly higher than we predicted, emphasizing the importance of accurate Muckleshoot Coho fishery reports. We encourage readers to refer to our first Numbers Don’t Add Up story where we question the reporting patterns of this fishery — which casts a shadow over the accuracy of these Chinook reports as well. Any under-reporting of Ship Canal catch by the Muckleshoot Tribe would in turn have significant repercussions on Chinook as well as Coho. We maintain this still bears scrutiny. On the saltwater side of the Locks, let’s look at the Suquamish fisheries. They reported catch of 2,516 Coho in September — so we expected on the order of ~100 Chinook to be reported caught along with them–as gill nets are notoriously un-selective between salmon species. Their reported Chinook catch? Zero Chinook. Zero. Now that doesn’t seem reasonable, but let’s double check the math on that. During the first 2 weeks of their Coho fishery, the Suquamish reported netting 1,900 Coho. Over that same 2 weeks 7,400 Coho got past the nets and were counted at the Locks. 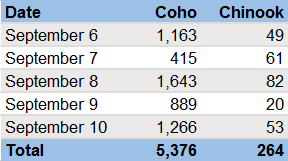 So the Suquamish report catching about 20% of the Coho which passed their nets. In that same 2 week period, the locks counts show 120 Chinook — so what are the odds that all those Chinook dodged these same nets? Each had an 20% chance of getting caught, but could 120 all get lucky? Some quick math (80%)120 and you quickly realize that’s impossible. The odds are one-in-425 billion against the “0 Chinook” report being accurate. We assert that the Suquamish reporting of Ship Canal Chinook is demonstrably incorrect, and is now a second example of questionable Tribal reporting in the Lake Washington Ship Canal fisheries. This all said, we are not asserting that these two fisheries caused the entire disappearance 4,000 Chinook, or even most of those fish. We have shown that both Tribal Coho and Chinook data sets have notably questionable patterns, and as a result bear further scrutiny. As such, we renew our call on the co-managers to commit to a plan which improves the transparency and trustworthiness of catch reporting within this system at least for the next few years. The goal should be to clearly and confidently ascertain that under-reporting is not a significant factor in these fish losses. With such a critical run in question — we should all be doing what we can to sort of out if harvest practices (and malpractices) are a significant contributor to the disappearing fish. Possibility 2: Did They Just Die Off Somewhere? Researchers have observed a phenomenon in salmon called “Pre Spawn Mortality” (or PSM)–which as you probably can guess is a salmon that dies off before it’s able to reach its spawning grounds. Typically this is assessed by examining carcasses of salmon and, for females, evaluating the percentage of their eggs which remain inside the fish at the time it died. If over 75% of her eggs remain, the fish is considered a PSM victim. Studies have suggested that some combination of water temperatures, toxic stormwater runoff and parasites all might contribute to PSM cases–particularly in an urban watershed like Lake Washington… We wanted to find out if PSM — in this case for Lake Washington Chinook, was a reasonable explanation for the 4,000 missing fish. Conveniently, in February, King County published a study covering a large swath of the exact Lake Washington system we’re discussing here. They found — walking these same rivers and streams just a year ago (2015) — less than 1% PSM mortality for Chinook running up the Sammamish Slough. Also 2015 was a year when water temperatures were higher than normal–which we expected would have exaggerated any PSM effects in the study. Given all this, and knowing we’re trying to explain 45% (overall) and 55% (wild fish) mortality, it’s hard to see how PSM could be the prime force behind these missing fish. Possibility 3: Maybe They Didn’t Really Exist At All? In many ways, the most simple explanation is that these fish never existed in the first place. How is that possible? Simple! 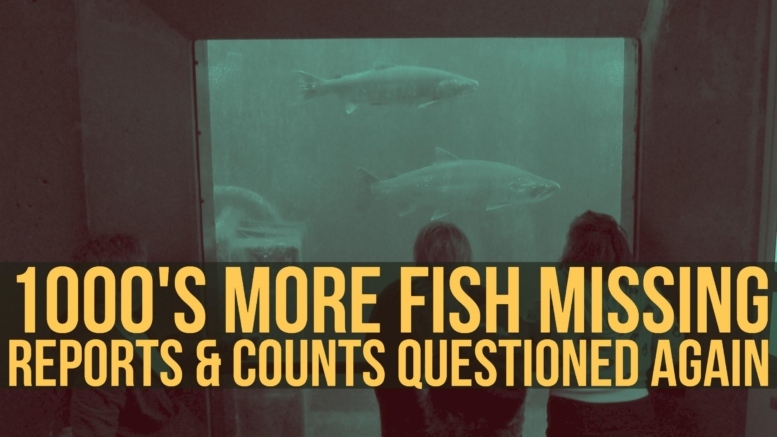 If the methodology of actually counting fish at the Ballard Locks is significantly flawed and somehow overcounting Chinook, then maybe they never existed in the first place. Could that be happening? Our understanding of the counting methodology is that it involves two parts: Window counts and Locks counts. Window fish are counted by hand as they pass a window in the fish ladder. Counting typically lasts for a 130 (sometimes 110) minute period each day. This ~2 hour sample is then mathematically expanded to represent the entire day–typically by expanding this 2 hours to represent the number of daytime hours at that time of the year. While certainly there’s some unavoidable human error, and the expansion of the 2 hour sample to a full day isn’t perfect, these seem like reasonable data points overall. The second group of Locks counted fish are the ones which skip the fish ladder and instead transit upstream inside the boat locking chambers themselves. The fish counting staff records the number of fish they see in the locks, the number of times the locks was used during the day, and how many of those locking operations they were able to count fish for. We believe the large locks is the only one considered, as the number of locking operations per day is always 10 less, which is well below what we believe to be the frequency of use of the small locks. One clear question we have is how fish can be counted inside the boat locks? Many of us have transited the locks ourselves and can’t imagine how one could accurately determine both the number of fish as well as their species (Coho vs. Chinook) in this environment. The human element plays a role here too–as individuals with an interest in seeing fisheries open could unintentionally be rounding counts upwards. Especially in a difficult to count scenario like this, these subtle pressures can have profound effects. What we know for sure is that these locks fish counts account for nearly half of the total fish counted — so certainly error in this methodology could significantly contribute to the “missing” fish we’re seeing. Unlike the Window counts, we leave this analysis with serious concerns that this Locks portion of the count needs further study. Some 4,000 Chinook appear to have vanished between the Ballard Locks and the nearby spawning grounds, including 1,200+ ESA listed fish. The magnitude of this mortality exceeds tenfold the impacts of all sportfishing in the state, and deserves much further scrutiny. In the search for root causes, we’ve uncovered dubious Tribal catch reporting, as well as raised structural questions about the locks counts themselves. Only when we have trustworthy counts and catch reporting can we claim that this critical driver species is being well managed. Lacking any meaningful catch report verifications, and considering less-than-precise Locks count techniques, we are far from that standard today. And finally, we note that these fish disappearances are a repeating phenomenon. We have found it in 2016 Coho (10k missing fish), 2016 Chinook (4k missing fish), and even as far back as 2004 there were similar fish-vanishing cases documented among Sockeye in Lake Washington. We certainly don’t have all the answers, but with these disappearances happening now on critical driver stocks — it’s time for the Co-Managers to get to work. 17 Comments on "Numbers Don’t Add Up #2 | Lake Washington Chinook"
The value of this resource dictates a much stronger effort be made by WDFW and the Tribes to accurately track the number of returning salmon. The tribes must truly police their fisherman and the state must accurately count the return. Get er done people! with fish and game checkers at all hot spots and boat ramps for licensed fishermen, isn’t it about time to check on tribal fishermen/women too ? ok, well better late than never, but enough is enough !!! lets address this problem realistically. Everyone must be accountable. this has to be addressed right now, before it gets any worse. 10 years from now, you will All see the magnitude of this careless act these tribes do. And salmon will be just a rare site ! I’m glad this issue is finally getting some of the publicity it deserves. As a sportfisher myself, I too am tired of ALWAYS being part of the group that makes the bulk of the sacrifices when it comes to salmon management. Thank you for bringing this issue to the fore and thanks for your continued efforts on behalf of the sportfishing community of Puget Sound! I’m appalled by the fact that no matter how you measure it fewer than 10,000 fish returned. We need to focus energy on removing the barriers to making more fish. Maybe get the nylon nets out. They are the problem and no one has the balls to stand up to the indians. The Hoh indians are netting the river here, I thought spring salmon fishing was closed? Is it that hard to understand the problem, remove the net fishing and prove what happens. Our state could be a world class sport fishing destination, resulting in millions of dollars being spent in our local economies. Unfortunately, our dysfunctional and (corrupt) fisheries management continues to turn its attention to a select few all the while our resources dwindle to the point of collapse. There is only “Con” in conservation in this state with our current WDFW leadership. Do we not question the numbers of fish actually being caught or killed in recreational fishing,all I read on this site is how important some of your readers think they are to this states economy.Creel counts at boat launches is a joke,punch cards are a joke,let’s get real about fish counts. Pretty tough argument to win when there is no recreational fishery for Chinook in this system. Expanding beyond that to recreational Puget Sound Chinook monitoring overall — we’d encourage you to learn more about the 100’s of thousands of dollars spent annually by the state to conduct creel counts, on-water test boat fisheries, and matrix that against catch record cards into final modeled catch data. By any objective measure this system is providing statistically significant data. We would welcome you to provide any case study showing the state in-season or post-season management numbers (modeled off of the data streams we’re pointing you at) for Puget Sound Chinook recreational are not accurate. And for sure don’t look at the numbers on the dollar value to the economy of a recreationally caught fish vs. a commercially caught one. It’s not close, and as one involved in the commercial fishery — you won’t believe the numbers because they don’t tell you what you want to hear. Our position is simple — the highest and best use for this natural resource is recreational fishing. Tribal C&S fishing is the only other fishery that could argue to be in that class. The Lake Washington Sockeye netting at the locks is going right now. The nets were full yesterday. Who will be monitoring those counts? There will be Ceremonial & Subsistence fisheries for the Muckleshoot and Suquamish tribes… Muckleshoot fishery ends at 1000 fish, the Suquamish fishery is 2500 fish. We can’t speak to the mechanisms used to ensure the accuracy of these counts, if any. And what about the trail of fish carcasses seen dumped overboard during the Lake Washington coho netting season? I was told that the tribes were to keep, hold and count all incidental catches (sockeye, trout, bass, Chinooks) and subtract the salmon incidentals against the lock counts. The trail of carcasses would suggest otherwise. When will we ever see tribal enforcement? Paul, can you elaborate or substantiate this? We’ve not heard of anything like this previously. Where are the coho counts for 2017? 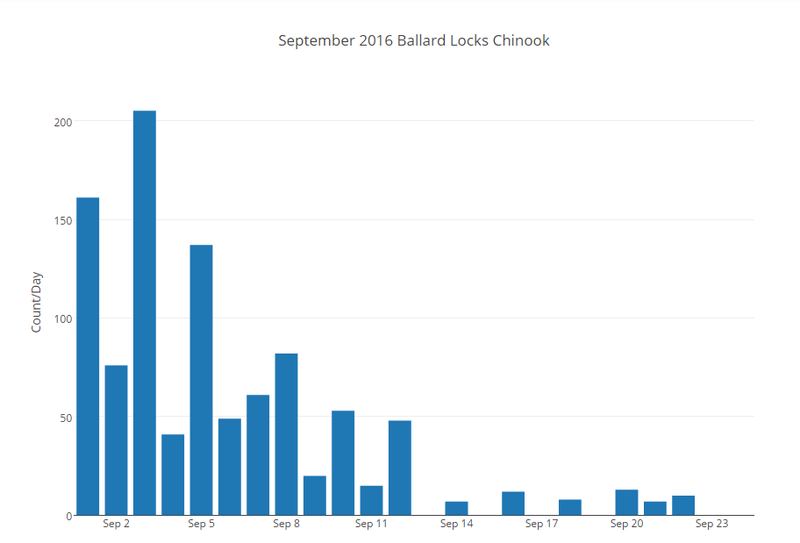 You’ll find the 2017 chart in the bottom left corner of the Ballard Locks counts page. Today (10/21/17) I walked along Lake Washington Blvd from Horton St. to Lake Park Drive S., a 16 minute walk. During my walk I counted 7 dead floating salmon visible from the shore. On previous walks I saw from 2 to 5 dead salmon on that same stretch. I would guess they weighed from three to five pounds. They seemed intact. Perhaps someone could investigate species and cause of death.